A version of this article appeared in symmetry on April 8, 2014. 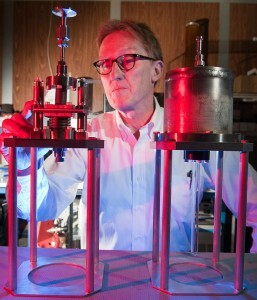 This article first appeared in Fermilab Today on April 15, 2013. Scientists around the world are working to understand the nature of dark matter, which accounts for most of the mass of the universe. The earth seems to be moving through a cloud of dark-matter particles that encompasses the visible parts of our galaxy. We should be able to sense this dark matter if we can deploy detectors that are sensitive to the ‘billiard ball’ scatter of a dark matter particle from an atomic nucleus inside these detectors. 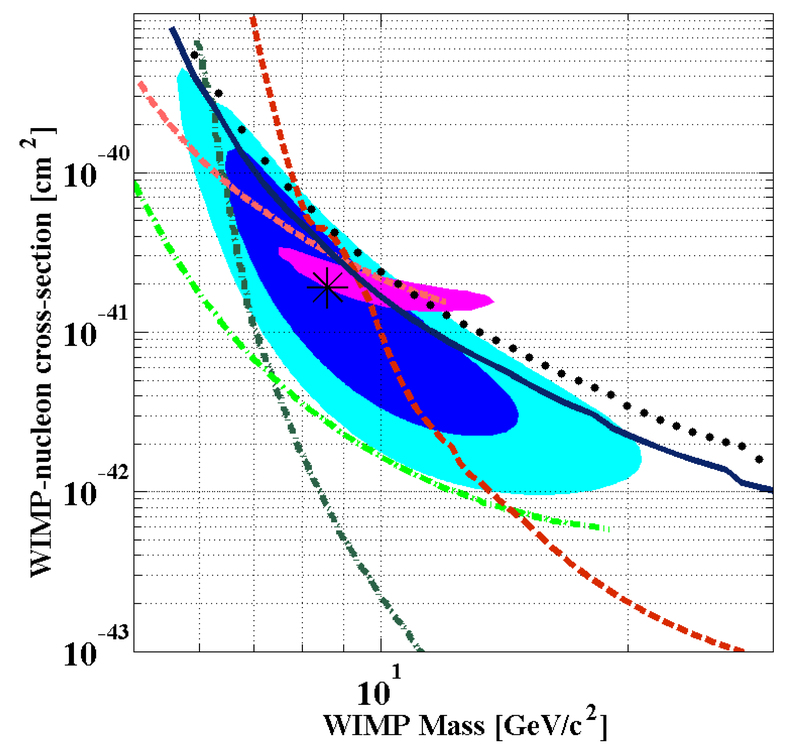 Experimental upper limits (90 percent confidence level) for the WIMP-nucleon spin-independent cross section as a function of WIMP mass. The black dotted line is from the present analysis, and the blue solid line includes previous CDMS II silicon-detector data. Also shown are limits from the CDMS II germanium-detector standard and low-threshold analyses (dark and light dashed red), as well as limits from the XENON collaboration (dark and light dash-dotted green). 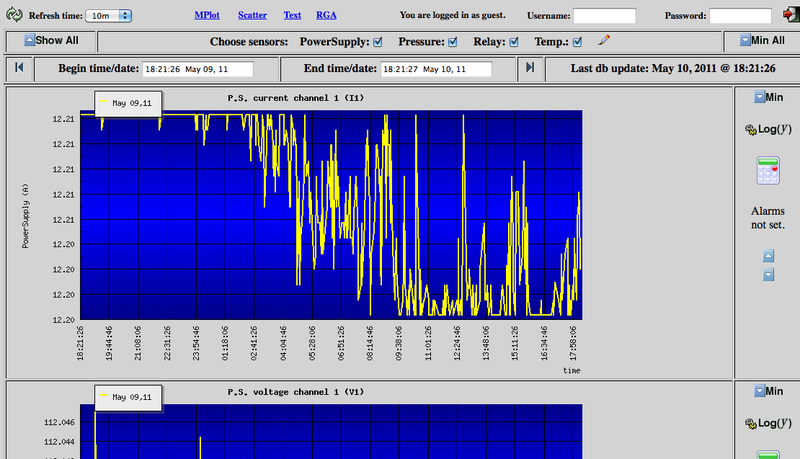 The magenta oval shows a possible WIMP signal region proposed to explain data from CoGeNT. The light and dark blue regions indicate the 68 percent and 90 percent contours obtained if the present result were to be interpreted as a WIMP signal. The asterisk shows the maximum likelihood point under this interpretation. 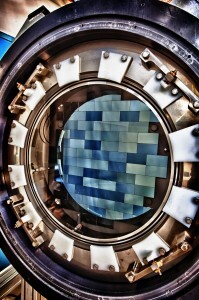 The Cryogenic Dark Matter Search (CDMS) experiment was designed to do exactly that, using germanium and silicon detectors cooled to very low temperatures in order to detect the electric charge and heat liberated by single dark-matter particle collisions with nuclei and distinguish them from the messier interactions created by normal matter. At the American Physical Society April meeting in Denver, the CDMS collaboration presented on Saturday its blind-analysis results from data taken with silicon detectors during CDMS II operation at the Soudan Underground Laboratory. Kevin McCarthy, a graduate student from MIT, presented the results, which were submitted to Physical Review Letters. The blind analysis resulted in three candidate events. Although this number is higher than the expected background of roughly half an event, this is far from a discovery. Simulations of the known backgrounds indicate that a statistical fluctuation could produce three or more events about 5 percent of the time. In other words, if the experiment were done 100 times, five of them would show at least three events in the signal region even if dark-matter particles did not exist. However, there is more information on the characteristics of the expected background events and the expected signals from weakly interacting massive particles, or WIMPs, which are the favorite particle explanation for dark matter. A likelihood analysis that includes the measured recoil energies of the three events yields a 0.19 percent probability for the background-only hypothesis when tested against a model that includes a WIMP contribution. This translates into roughly a 3-sigma confidence level for the hypothesis that the three events are due to WIMP interactions. This is exciting but still does not meet the scientific standard for a discovery. Further investigations are necessary. Nevertheless, if one indulges in a “what if” scenario and interprets the result as due to a WIMP signal, the WIMP mass would be around 8.5 times the mass of a proton. For the simplest theories of WIMP interactions and using the Standard Model for dark-matter distribution in our galaxy, the rate found for such interactions is in some conflict with the current results from the XENON experiments. The paper presents more details. In 2010, the CDMS collaboration published results on dark-matter searches with germanium detectors, which resulted in two events in the signal region and an estimated background of 0.8 events. The conclusion at the time was that these events were likely leakage surface electrons rather than true nuclear recoils, and other experiments have not found any signals in this mass region. 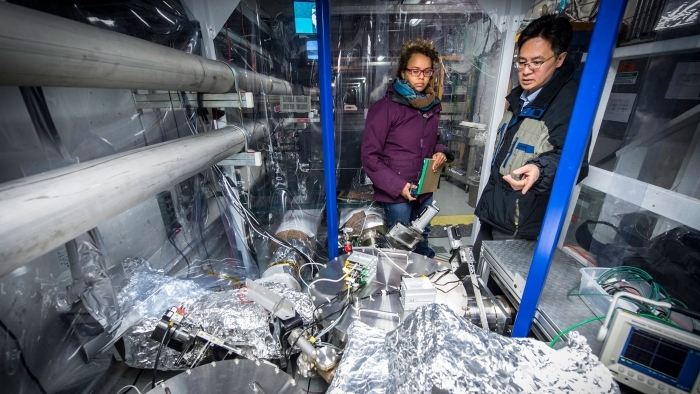 The SuperCDMS Soudan experiment is currently taking data with larger, and better, germanium detectors, and hopes to shed additional light on low-mass WIMPs before the end of the year. The collaboration is considering the use of silicon detectors in future experiments. A four-ton digital camera landed safely in Chile last week on its way to making history by enabling the world’s largest galaxy survey, starting next year. Getting the camera there was a worldwide feat of technlogy and transportation prowess. Doing big science, such as building the Dark Energy Camera, takes big effort and big cooperation. Building and installing one of the world’s largest digital cameras to conduct the most extensive galaxy survey to date as part of the Dark Energy Survey experiment required scientists and manufacturers from across the globe. Researchers from more than 26 institutions enlisted the help of 129 companies in the United States and about half a dozen in foreign countries to fabricate the often one-of-a-kind components for the camera. Most components for the camera migrated to the Department of Energy’s Fermilab for testing and assembly, as seen in this timelapse video , before being shipped to the four-meter Blanco telescope in the remote Chilean mountains. The journey required help from planes, trains, trucks and boats to traverse continents and oceans, and ended with an 11-hour drive to a mountaintop. The DES’s combination of survey area and depth will far surpass what has come before and provide researchers for the first time with four search techniques in one powerful instrument. To find clues to the characteristics of dark energy and why the expansion of the universe is accelerating, DES will trace the history of the expanding universe roughly three-quarters of the way back to the time of the big bang. During five years of operation, starting in 2012, the 570-megapixel camera will create in-depth color images of one-eighth of the sky, or 5000 square degrees, to measure 100,000 galaxy clusters, 4,000 supernovae, and an estimated 300 million distant galaxies, about 10 million times fainter than the dimmest star you can see from Earth with the naked eye. 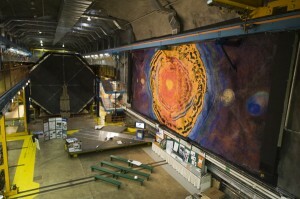 It will yield the largest 3-D map of the cosmic web of large-scale structures in the universe. This story first appeared in Fermilab Today Oct. 10. The 1970s were a thriving time in the world of physics, heralding such milestones as the development of the Standard Model and the discovery of the bottom quark. Now scientists at Fermilab are bringing some experimental pieces of that era back – bubble chambers and fixed-target physics. The Chicagoland Observatory for Underground Particle Physics (COUPP) collaboration looks for bubbles in chambers filled with a compound containing carbon, fluorine and iodine. The fluid is superheated beyond the boiling point but has no rough surface to form bubbles. When a specific type of particle interacts in the chamber, it can deposit enough energy to boil the fluid and make a bubble. Electrons do not produce bubbles, while a dark matter particle interacting with a nucleus can – making this the key for dark matter detection. The CITRE collaborators will use a fixed-target technique called elastic scattering of pions. The pions interact with iodine, the target nucleus in the COUPP bubble chambers with the most sensitivity to the most popular dark matter candidates. The pions are surrogates for dark matter – the bubble chamber sees them both in the same way by observing the bubble from the recoiling iodine. 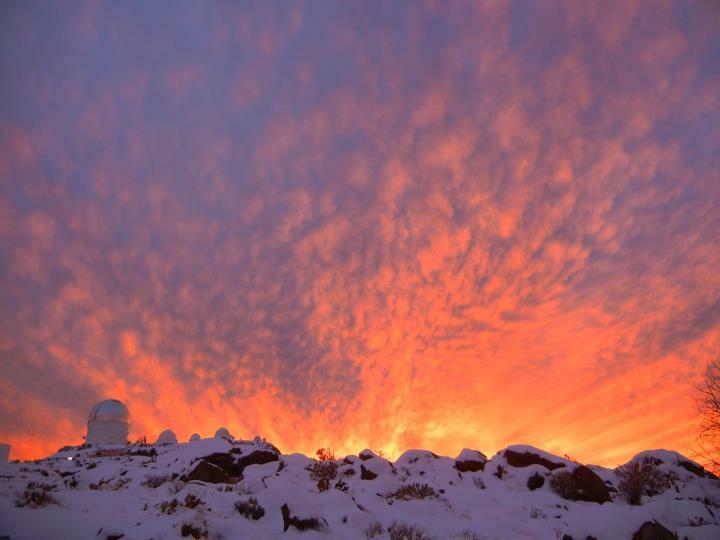 Blanco telescope, on left, at sunset in Chile. Photo: Brenna Flaugher. 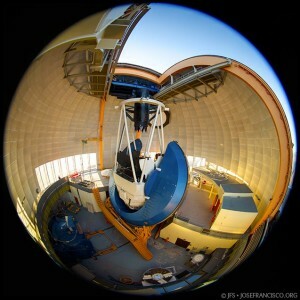 I have promised to provide updates on our progress towards the first light of the Dark Energy Survey’s, or DES. 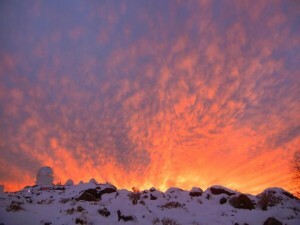 First light is the first official look at the sky after readying the camera and its detection software. If you recall, we were supposed to deliver the Dark Energy Camera, or DECam, imager this summer. So, without further ado, I am pleased to announce: Here it is! I have been collecting DES-related pictures and videos for a while and the picture to right by Fermilab photographer Reidar Hahn is by far my favorite shot of the imager (first published in Fermilab Today). It shows the focal plane completely populated with 74 shiny, blue CCDs, ready to catch some extragalactic photons. Shipment arrangements and installation schedule are being worked out as I write. Our team has already set foot in Chile to assemble at the Blanco Telescope the various parts that we tested on our Fermilab telescope simulator in February. Installation will start soon. I am joining them in November in Chile and can hardly wait. But this is when my wave-like abilities, which I mentioned in a previous post, comes to play. My wave function is now quite stretched as I perform a variety of tasks these days. Read on and see it for yourself. Galaxy clusters are my favorite thing in the universe, and in addition to my work on the DES cluster analysis group I am now building a new catalog based on the Sloan Digital Sky Survey, or SDSS, data. 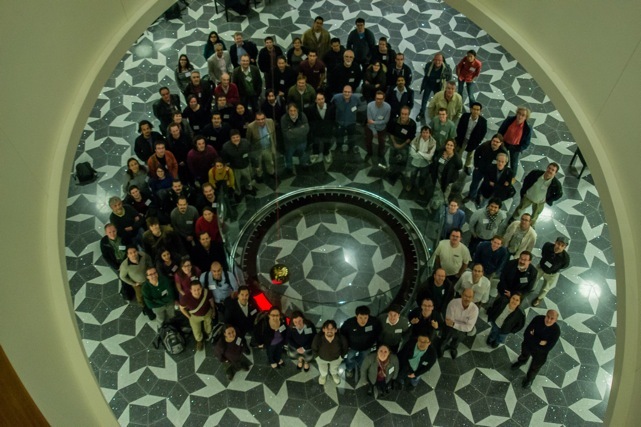 Our group at Fermilab is wrapping up all the parallel threads of work on that data set, and that means that I am doing a lot of writing these days, too. Papers are coming out soon and this is terrific news, which puts my mind at ease with respect to that nightmarish pressure for publications. I’ve also been volunteered to help in the calibration group by writing a code, which was being referred to as “George” until we found a more appropriate name. But since people now ask me, “How is George doing?” all the time, I am afraid the name has stuck. Right now I am working in the first module, “George I”, to process a series of monochromatic calibration images and create a map of the system response curve at every point of the DECam focal plane. This new task is exciting because it connects the instrument I helped build with the science I want to do (good calibration is an essential requirement for cluster science) and it also gives me the opportunity to learn more about our data management system. The reason for my excitement about this is the fact that a reliable, fast and easy-to-use database is the key for success and productivity in our field. I use the SDSS SkyServer for all my SDSS analyses and it is just great to be able to upload a text file with sky coordinates and visualize, with a single click, all the objects you are interested in. Every time I submit a query to the SDSS database, using the CasJobs web interface or my own little scripts, I wonder what the DES equivalents for that will look like. It feels a little like waiting for the next release of your favorite gadget. And as a heavy user and big fan, I, of course, have my own wish list of improvements. My number one wish? Support to upload my own little codes, in addition to data tables, and run them directly on the query outputs. This way I could save only the processed tables, use them later in combination with other data, make all my plots and download only the final results. That would make my work so much easier! Well, but I’d better stop here and go back to work. George is doing well today, but there is still a long way to go. I will be back with more updates soon. Stay tuned. Editor’s note: Bob Peterson ends his month-long journey in the Atlantic Ocean with two cosmic ray muon detectors, collecting data for science and education programs that use similar detectors. Look for future Quantum Diaries posts explaining how the data gets used and how the two detectors get used on dry land. Hopefully, you’ll also get to see some of the photos from the journey, which Peterson couldn’t send from the ship. Follow the 10-part journey here: The voyage begins, Turning the detector on, Other science on the sea, Particle detectors don’t like light, Enduring a branding for science, A teaching moment on the ocean, Using ballons to study the sky to help IceCube and QuarkNet, Cosmic ray detector weathers sea mount survey and storms. France just showed up off the starboard rail. We’ve been in the soup since entering the English Channel, fog so thick you can’t see the toes in front of your feet. All the surrounding ships disappeared and the onboard birds are staying close. The only means of verifying location is the radar and the navigator’s chart. The ships had to trust the captains and the captains had to trust their charts. Scary for the ships; they have no eyes. But, there is France. We will be off Calais in an hour and half. Hope the visibility holds. This will be the last blog installment as the radio officer shuts down the mail server tomorrow at 1200 ship time; not 1201. There is much activity onboard as data-taking has stopped and instruments are finding their way to packing cases. The experiments I’ve talked about in these posts are finished: no more LIDAR, no more microwave cloud measurements, no more deep-echo sounding,. But the cosmic ray muon detector keeps clicking over. I’m going to take data all night; shut down and pack up tomorrow morning. Arrival at Bremerhaven will occur at 0600 Friday morning assuming the pilot is on time (remember Las Palmas?). Quick good byes as the German scientists want to get home. The crew waits for their “pay-off” as in the old days before they depart the ship. Then the Polarstern goes to dry dock for “haul-out” and maintenance. It will have three weeks out of the water and then departure for the Arctic. Much of the same crew will sail again including Max and Klaus in the weather office. Ship’s bell just rang for dinner. Thanks to all for reading and sending me mail. It was nice to feel the connection from friends, family and colleagues when so far away. *Starboard: The right side of the ship. *Pay-off: After a ship’s arrival in port, the captain would meet the crew (who had spent the night on the town) the next morning to pay the crew in cash or gold. *Haul-out: In the old days, a ship would be pulled out of the water using a railway and cradle; now ships use dry-docks, which pump the water out of the basin containing the ship. Hi everyone, it’s been a few weeks since I did my introductory post on who I am (my name is Hugh) and what I’m working on (dark matter detection with bubble chambers, as part of the COUPP collaboration). I fear it has been too long for there to be any continuity between the previous post and this one, so I figured I’d go in a different direction and talk a bit about the uncertainty (or unexpected challenges) of working in science. I decided on this topic after I just spent a few minutes clicking through the past week of entries here on Quantum Diaries. 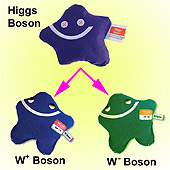 There really is quite a lot of information being posted here (including a really nice, detailed description of the Higgs boson, which was useful to me).I’m particularly enjoying Bob Peterson’s description of his journey around the world. We’re certainly covering a wide range of topics. One thing I did notice is that people are writing a lot of explanations – how things work, how their detectors work, what we’re trying to discover. I think this is really good stuff and I’m glad we’re writing about it, but it does give the impression that we generally know what is going. Unfortunately, my experience, and therefore the subject of this post, is that a lot of the time my experiments do not go as expected and I often find myself rather confused (I suspect that other people have the same experience, but I’ll be safe and speak only for myself here). First, experimental physics never goes exactly the way you planned it. Something always goes wrong. To give a particularly disastrous example, my lab flooded once in when I was at Yale for graduate school. Most experiments have some form of basic monitoring system called “slow control.” The slow control is constantly taking measurements of the pressure or temperature of a system and reading back to some kind of database. Often, they will be set up to send the experimenter a warning of some kind when a reading is out of safe range – for example, if a pressure gets too high. On this particular occasion, I was running a chamber filled with liquid neon, which is a liquid at minus 248 degrees Celsius (or 25 Kelvin). I think it was a Friday or Saturday and I was out to dinner with a friend when I got a text message – “ALARM: T1 out of range! T1 > 28 K!” – that the temperature was rising and therefore pressures might be getting a bit high. While there was no physical danger due to the safety systems that are engineered into experiments like these, often the safety systems will not protect against the loss of the experimental run itself, which in this case would have cost me several months and delayed my graduating. And I wanted to graduate. I broke a few traffic laws on the way to my lab (fortunately I was not too far away) and was faced with the scene shown in the picture. 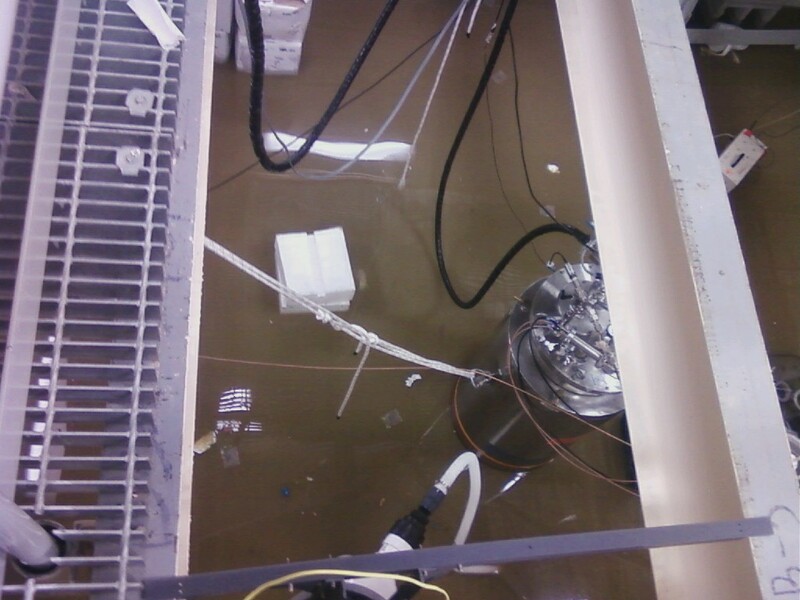 It may be slightly hard to tell, but normally there is a large 4-foot by 8-foot pit in the middle, where the stainless steel cylinder is sitting, but in the picture the pit is completely full of water. 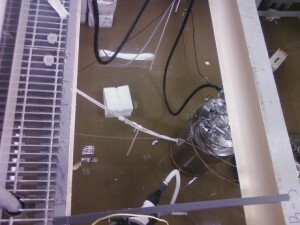 There is rather a lot of expensive equipment sitting around the room, also in water. I ran down the stairs, shut everything off, found the source of the flood (a plumbing connection that had burst) and prayed that it would be OK; which, thankfully, it largely was. I had managed to shut off the water before it could damage any of the more sensitive pieces of equipment. The only thing that broke was a single fuse in my cooling system, and I ended up losing only two weeks. That’s equipment failure, and that does happen often. And we try to learn from these incidents to make our experiments safer and more robust (in the previous example, the slow control alarms worked perfectly and a freak flooding accident did no permanent damage) However, at least it’s generally pretty easy to tell when something physical in the experiment has broken down (although the cause can be elusive). If you’ve been paying attention to recent popular physics news, you’ll have noticed that various “excesses” are all over the place at the moment (in dark matter, at CDF at Fermilab, at the LHC). These are examples of data that we do not fully understand, and we really don’t know what is going on yet. In the next post, I’ll talk a little bit about the current run of COUPP, which produced some really strange results back in November and December that we’re still trying to figure out. Editor’s note: Bob’s most excellent particle detector adventure, part 9. Bob Peterson continues to travel with his QuarkNet particle detector around the edge of Africa recording remnants of cosmic rays. This offers a chance to study how cosmic ray recordings differ on land and sea and at different latitudes. 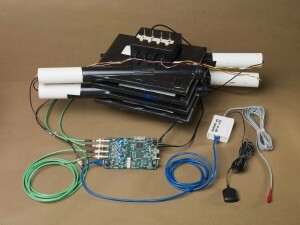 The data will be accessible to high school students and teachers in several countries who use similar detectors to learn about particle physics. His previous posts: The voyage begins, Turning the detector on, Other science on the sea, Particle detectors don’t like light, Enduring a branding for science, A teaching moment on the ocean, Using ballons to study the sky to help IceCube and QuarkNet, Cosmic ray detector weathers sea mount survey and storms. At the height of the storm, it blew at 45 knots and Klaus estimated wave heights at 20 to25 feet tall. (As a weather technician, that’s what Klaus does; estimate the wave conditions. He also launches the weather balloons. More on that later.) My bunk runs fore to aft, which made the ship motion easier to bear; athwart ship and I would have gotten rolled out of my bunk. Still, I did not sleep well for two nights. But, Max and Klaus said that was nothing. They shared stories and pictures of hurricane force winds in the southern ice. By Monday afternoon the storm had blown itself out and the waves had gone away and wind had gone away and the entire ship’s company had a nice pleasant BBQ dinner: well- deserved with roast pig and all the trimmings. On the Saturday when Julia launched the balloon, it got caught in the slip stream behind the ship and forced down and toward the large A- frame mounted on the transom. The ship stern pitched up; the balloon went down and zoomed under the A- frame. Klaus said, “Hmmmm, never did that before!” Unfortunately, the radiosonde dipped in the water and the entire signal was lost. A busted flight. The ship board pulse has quickened as we are a couple hours from entering the English Channel. This is a controlled water way. So, ships are under guidance and obliged to stay on the right-hand side of the road. And just as the second mate predicted, many ships are now on the horizon converging to take their turns through the Channel. I count eight within view, and they are BIG ships. Home is not far. We will arrive in Bremerhaven at 0600 Friday morn. Michael Walter will meet me and proceed with one cosmic ray muon detector to DESY, a physics laboratory in Germany, for use by education groups in the area. Tomorrow, I will disassemble the detector marking the end of the data session. My cosmic ray muon detector will end up at CERN, the European high-energy physics laboratory in Switzerland. *Aft: The opposite of forward. Tricky, eh? *Athwart ship: If fore and aft runs the length of the ship, then athwart ship is across the width of the ship. *Transom: The flat surface forming the stern of a vessel. *Pitch: A swaying or oscillation of a ship, aircraft or vehicle around a horizontal axis perpendicular to the direction of motion. *Radiosonde: An instrument carried by balloon or other means to various levels of the atmosphere and transmitting measurements by radio.